Thoughts, Design and Construction of Kingstons' first "Passive House"
Our final shipment of panels has arrived! The small city lot means we really have to make efficient use of available space, so even the mound within the garage footprint has become a staging area for panels. We quickly constructed a ramp and double-staircase to aid in moving the 10-foot panels. The panels are a bit heavier than they look. Two people can handle a panel on flat surfaces, but it’s much easier (and safer!) with four people when going any distance or changing elevations. The bridge in the above picture was a big help for logistics, but it certainly isn’t of the “thermal” type, so I’ll get to the point. Thermal image of an insulated wall. Thermal bridges are a problem in any building, so we go through a great deal of trouble to minimize their effects in a Passive House. Complete elimination would be ideal, but drastic reduction is the reality. Missing from the above picture, is more (thermally-broken!) wood at the end of the SIP lintel. 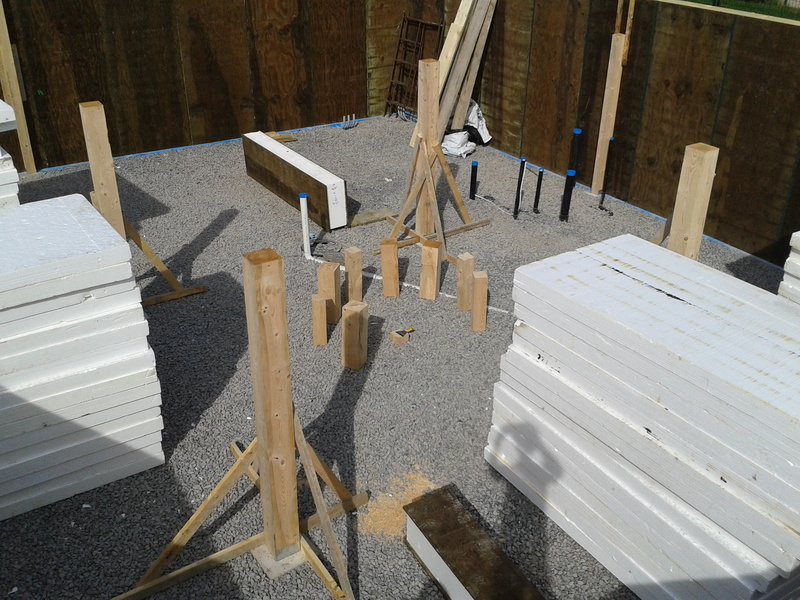 The wood is necessary to transfer loads down through the jack studs, but again a pair of 2×4 supports is plenty strong and will outperform a single 2×12 in terms of resistance to heat-conductivity. We will get even more creative on the second floor, where ledgers are attached to the house for supporting the porch roof, but you’ll have to wait a bit for those pictures. The Kingston Passive House team has had a busy (and very toasty!) 3 weeks. There was not as much soil as we were hoping for, so we opted to hammer through the top 14″ layer of limestone (subsequent layers are much harder) and resigned ourselves to the fact that Kingston Passive House will just have to sit a bit higher on the lot. One benefit of the increased elevation is the basement floor will be higher than the sewer and storm laterals – no sewage-ejector required for the basement bathroom rough-in! Since the house sits on bedrock, we also reduced the footing and pad sizes; we used less concrete and lowered the house by another couple of inches as a result. The “blue” you see on the footings is a capillary break. 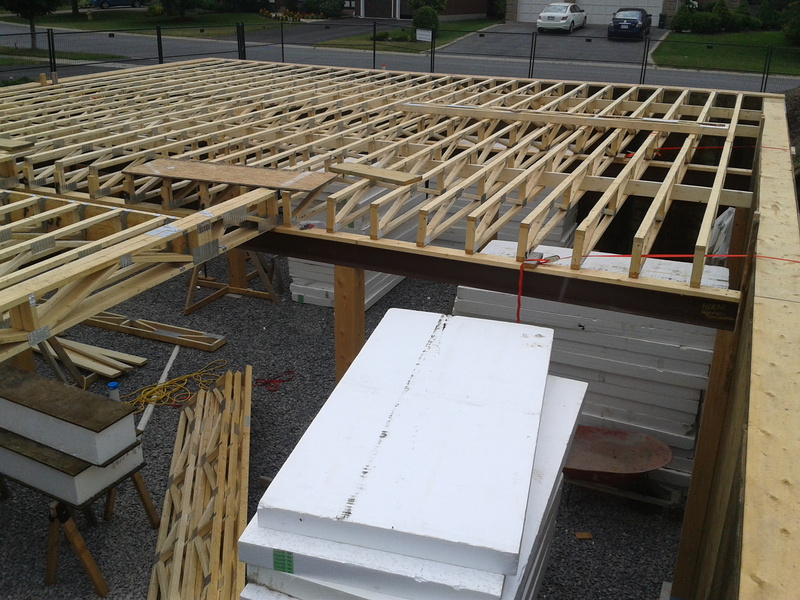 Although the Permanent Wood Foundation (PWF) SIPs are designed to function in a moist environment, we still want to keep them as dry as possible. The stepped footing in the back is for the garage; no need to pound through rock for that. Here you see the first four SIP sections are in place… the beginning of a very well insulated home. The water-filled hole is for the sump pump and tank. If you look closely (click on the image for a better view) you can make out the six PVC conduit sections through the footing at the back. These are for the three loops of 3/4″ PEX that will make up our Subsoil Heat Exchanger (SHX). The pipes will exit the house, and travel around the perimeter of both the garage and house before coming back in. 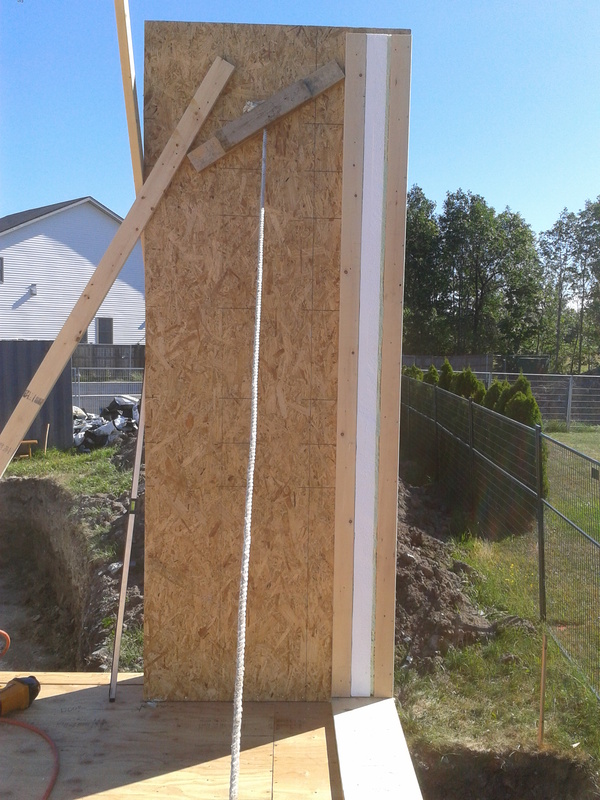 You might also notice the footing extensions; A SIP can not handle a concentrated load (such as the end of a beam) so you can either carve out insulation and embed a post in the wall, or place the posts right beside the wall and avoid creating a thermal bridge. This next photo shows our hemlock posts in place. Foundation walls up, Posts in place. They sit on a galvanized steel saddle to keep them secure. The saddles also act as a capillary break between the hemlock and the concrete footing. Why hemlock? Placing 9 hollow steel posts through the basement floor and sub-slab insulation would represent a significant thermal bridge. The wood posts will not conduct heat energy into the ground to the same extent as steel. You could also argue that wood posts have a lot more character than steel. Even the offcuts were destined for a higher purpose; inspiring the crew to create “Hemlockhenge”. The piles of recycled EPS are only half of what is required for sub-slab insulation. There will be two layers (ten inches total) below the concrete slab. Radiant heat would be overkill in this house, so the only thing in the slab will be some reinforcing steel. We don’t often associate “earth” with a fresh air supply, yet earth and air do make a great team in a high-performance home. The concept of passing air through earth as a means of tempering it is not new; the temperature of the earth is relatively constant once you get down 6+ feet below grade. When the ground temperature is warmer than the outside air in the winter, or cooler than the inside air during summer, we have an opportunity to harness some cheap geothermal energy! During the heating season, fresh air is essential but enters the home at a price. In a leaky home fresh air comes in at outdoor temperatures; this is why we need to get the air-sealing right… If we control where the air comes in, we can pass it through the HRV and harvest heat energy from the stale outgoing air. I’ve talked about HRVs in a previous post, and mentioned the importance of their efficiency, but the fact of the matter is, the colder the outside air, the cooler it will be even after going through the HRV heat exchanger. We need a constant supply of fresh air, so we can’t turn off the HRV during cold spells; we can however, improve HRV efficiency. 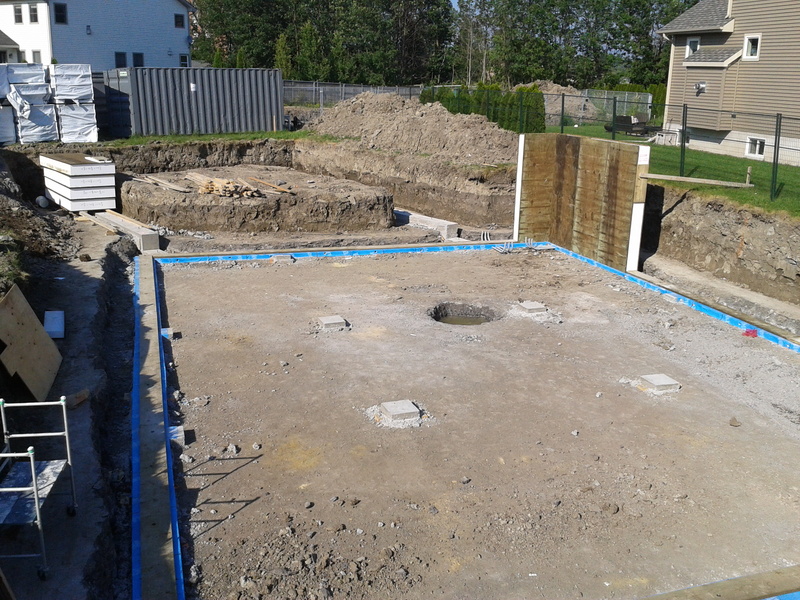 When building a new home, we typically have to excavate for the footings and foundation, so why not plan ahead and run some pipe beside the footings before back-fill? In a Passive House, these pipes are known as a Subsoil-Heat Exchanger or SHX for short. Earlier SHX implementations used earth tubes – essentially a large diameter intake for the HRV installed below grade. Although effective, the Passive House Institute no longer recommends earth tubes. If not perfectly installed, they become a trap for moisture. Where there’s stagnant water for long periods of time, there is mold and mildew; certainly not an environment suitable for transporting your fresh air supply. I’m a big fan of simple, and having no moving parts makes an earth tube very simple indeed; yet in the interest of guaranteeing healthy indoor air quality, perhaps a bit of complexity isn’t so bad: The alternative to moving air through the earth to pick up some of its heat, is moving a liquid. The large diameter earth tubes are replaced with 3/4″ PEX tubing and a highly efficient circulation pump moves food-grade propylene-glycol (protection from freezing) through the pipes and then through a liquid-to-air heat exchanger. This way, the fresh incoming air is warmed by traveling through the heat exchanger as opposed to the ground. The circulation pump runs on a thermostat so it is activated only when the incoming air is colder than ground temperature. In the summer, the SHX is set to run when it gets a bit warm inside. A separate heat exchanger is installed after the HRV, and subsequently has a cooling effect on the fresh air distributed to the house. This heat exchanger requires a condensate pan to catch any moisture extracted from the humid summer air. The soil is also important for SHX efficiency; if the PEX tubing is in a porous soil or (even worse) gravel, there is little surface contact and performance will suffer. In a dense packed soil such as clay, there is much better contact. 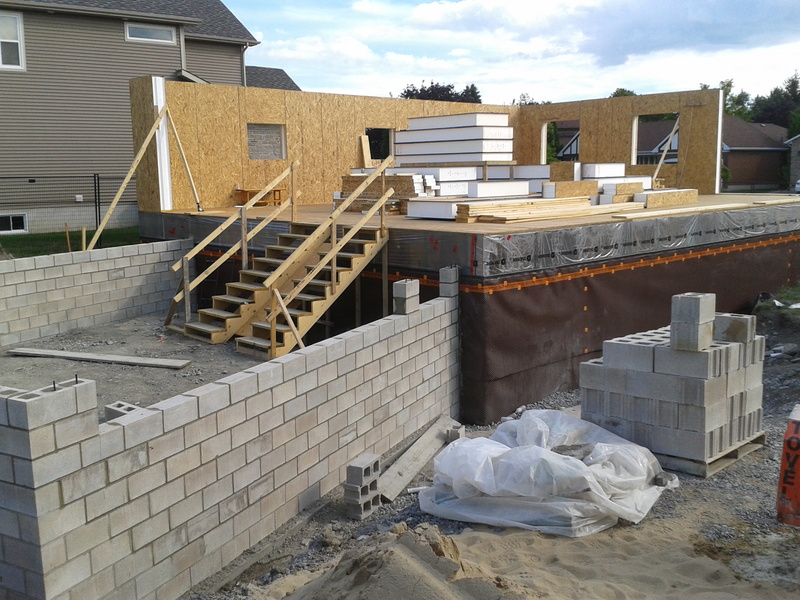 From a SHX perspective, we have ideal conditions at Kingston Passive House… clay on top of limestone bedrock. I’ll post pictures as the SHX components are installed. New look, new logo… and a Permit! I mentioned earlier that we (finally) got a permit from the building department. What should have been a 2-3 week process, took 2 full months. 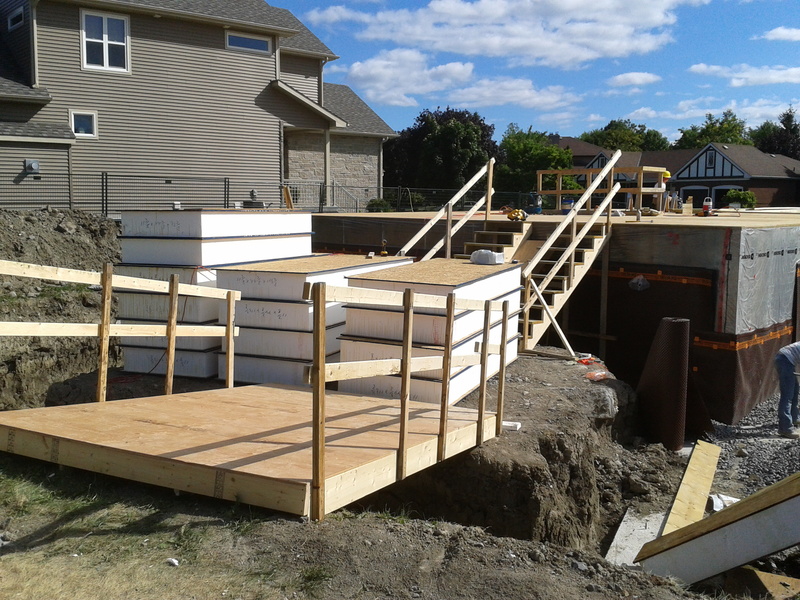 Why you ask?… there were a few hurdles, but the biggie was our choice of materials for the basement foundation. There are a handful of options, but most contain concrete (a thermal-bridge extraordinaire!) and in the interest of minimizing this “high embodied energy” material, we looked for trust-worthy alternatives. One rather neat alternative is Durisol; it’s a variety of ICF (Insulated Concrete Forms) that minimizes concrete use, and doesn’t use EPS insulation like conventional ICF solutions. But if your goal is a truly thermal-bridge-free assembly, there is one product that really stands out: SIP or “Structural Insulating Panel”. SIP wall assemblies have been around for many years and are quite common in high performance homes for above-grade applications. 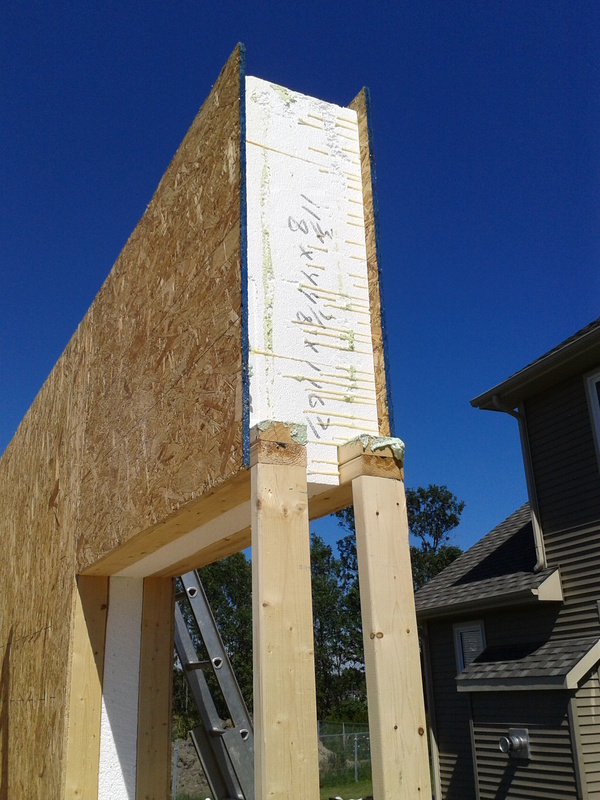 What is a little less common, is the use of SIPs for below grade applications. This product has also been around for many years… just not here in Kingston. Unfortunately our building department views anything unconventional as a liability risk, even if it has engineers stamps, is backed by a phenomenal warranty, and meets the Ontario Building Code !! This isn’t an ideal mindset for a city that is striving to become “Canada’s Most Sustainable City”. Embracing innovation and change should be priority. We have the permit, so it’s water under the bridge… ‘nuf said. We’ve also cleaned up the look/theme of this blog… let us know what you think! Have you ever lived in or visited a home and noticed curtains moving on a windy day? Perhaps you have unplugged something from a receptacle on an outside wall and found the plug to be cold. These are signs of a leaky house. In older (and some newer) homes, this is how fresh air is introduced to the home. So what’s the problem with a bit of fresh air?! We need to think about this from two distinct but related angles: Indoor Air Quality (IAQ) and Energy Efficiency. We spend quite a bit of time in our homes – particularly during the heating season. As occupancy increases, more oxygen is removed, more carbon-dioxide is produced, and exposure to potentially toxic air is at yearly highs because we don’t have windows open. Our cabinets, furniture, flooring and many other household goods, are constantly off-gassing; further degrading the quality of the air we breathe. You get the picture… not pretty. In a leaky home, fresh air is introduced around doors, windows, lights, receptacles, rim-joists and many other avenues. Bathroom fans and clothes dryers remove moisture-laden air from our homes, creating a negative-pressure which also draws fresh air in. Air is opportunistic that way and from a health perspective, that’s a good thing. Even on a still day, the stack-effect will help keep air moving, but it’s not consistent and unless you have expensive monitoring equipment, you have no way of knowing what your IAQ is. Fresh air is either forced in (wind) or drawn in and although good for our health, it presents a significant problem from an energy efficiency perspective. That fresh air is either displacing or replacing conditioned air; that is, air you have already paid to heat or cool. What we need is a means of regulating/controlling fresh air while capturing the energy from outgoing stale air. Heat-Recovery-Ventilators (HRVs) serve that purpose and have been around for many years. Most HRVs are installed so they draw air from smelly/humid locations (kitchen, bath, laundry) and deposit the fresh air into the cold air return plenum on the furnace. In a Passive House we don’t have a furnace or an air handler (typically) so the fresh air is delivered to the bedrooms, family room, office etc. The HRV in a Passive House also runs 24 hours a day, not just when you hit the button before your shower. This is an important distinction: Consistent, balanced introduction of fresh air is the secret to a much healthier home. Cross-Flow Heat Exchanger in a basic HRV. More Efficient Counter-Flow Heat Exchanger. As I write this post, I am aware of only one Canadian manufacturer of HRVs that incorporates a sizable counter-flow heat exchanger. We were glad to find it, but it would be nice to have options, and going with a European model is not only costly, but not Canadian eh! I’ll spare you the details of modelling an HRV in the PHPP software. Just know that it entails gathering all the performance specs, and that’s not a simple task considering North-American testing methods (www.hvi.org) are different from those in Europe. While the Passive House standard is (for the most part) non-prescriptive, there are a few areas where it makes sense to specify a certain level of performance based on your climate; windows are one such area. In my last post, I touched on a few aspects of window design, construction and tuning, as they pertain to a high performance home. Here, we’ll look into why window details are so vital to the success of a Passive House in terms of behavior and of course, the PHPP. As the adoption of Passivhaus spread to other regions of the globe, the Passivhaus Institute realized windows designed for a German climate were either insufficient or overkill in many of these differing climates. You could argue that a window designed for central Europe would work just fine in the Southern US and you’d be right, but in the interest of keeping costs down it isn’t reasonable. The PHPP modelling software won’t mind a bit if you over-engineer your windows; the problem is it might not mind if you under-engineer them either. PHPP will actually let you get away with double-pane windows in a Canadian climate if the rest of the building envelope is extremely well insulated and super-tight. The software simply does the math; if you meet the monthly or annual heating/cooling load demands (among other things), PHPP will give you the thumbs-up. If we think about the behavior of a double-pane window on a cold winter day in a Passive House, we’ll quickly realize why the institute has a minimum standard based on climate. In an average home, there is a heat-source below almost every window; this heat source helps reduce effects of the cold draft and creates air movement to minimize the formation of condensation. In a Passive House, the walls are thicker, so the interior glass surface is “further away” from room air currents. There is also much less of an air current because the heat demand is so low… The result? A double pane window (with its cooler inner glass surface temperature) will create a cold draft and promote condensation; two impermissible characteristics in a Passive House. Kingston is located in the “Cool Temperate” zone, making the minimum glazing requirement triple-pane thermal units with low-e coatings, argon gas fill and non-conductive spacers. The overall U-value for these windows can be no more than 1.1 W/(m² K) (lower is better), so the frame and installation details are vital too. This calibre of window will have a warmer inner glass surface temperature, resulting in a more comfortable space with greatly reduced chance of condensation; It makes perfect sense. PHPP calculates both heat losses and gains for each window in the house. To do this, it requires every intimate detail of your windows, including orientation, frame thickness, depth and insulating-value. It also needs the center-of-glass and spacer conductance numbers along with the solar heat gain coefficient (SHGC). On a different sheet, you’ll enter in the shading characteristics of window frame reveals, decks/balconies, overhangs and neighboring trees and buildings. The software does the heavy-lifting in terms of calculations, but if you aren’t using Passive House Certified windows, you may have to do some digging to get the necessary performance numbers from your manufacturer. North-American standards are typically NFRC (National Fenestration Rating Council), which are quite different from the CEN (European Committee for Standards) methods both in terms of what is measured and how. We were fortunate that our manufacturer let us talk directly with the independent lab that did the testing on their behalf. They had the numbers we needed for PHPP. 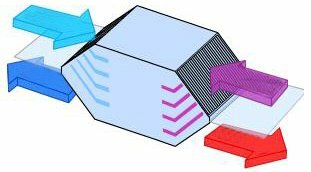 If it interests you, the Lawrence Berkeley National Laboratory offers (for free download) their comprehensive software simulators for insulating glazing units and frame assemblies: WINDOW and THERM respectively. They are fascinating bits of code. Specifying Passive House Windows: A Pane in the Glass? Few components affect the character of a home more than windows. They influence the appearance, lighting, ambiance, energy use (and gain) and ventilation to name a few. In a standard code-built home little thought is given to windows, but in a Passive House they are critical to it’s success. Aesthetics are important of course, and we’d like natural light in as many rooms as possible, but this is just the beginning. Over-sizing a North facing window or specifying the wrong low-E coating for a given location can be the difference between pass and fail. It is a delicate balance; a game of give and take. The neighborhood is established, and being relatively flat (and inland) we aren’t tasked with showcasing a particular view. The main challenge comes from the lot orientation. There isn’t enough room on the city lot to position the house for optimal solar gains. The front of the house faces North-West, but it is a corner lot so we have some decent exposure on the South-West side. There is also an existing house next door (to the South-East) which we felt the need to model for shading. We created a 3D rendering in SketchUp; geo-locating the house and rendering the neighbors house allowed us to see the shading characteristics at any day/time during the year. The SketchUp shading animations helped us place and size most of the windows on the house, along with proportions for the roof overhang. Lastly, they assisted us with modeling the shading characteristics of the neighbors house in the PHPP (Passive House Planning Package) software. PHPP is quite limited in terms of defining different shapes of objects in order to calculate their shading effects on each window. If this build were in Europe, we would have many types and manufacturers of Passive House Certified windows to choose from. Windows having passed the scrutiny of the International Passive House Institute are listed in the PHPP software along with their dimensions and performance factors. Using a certified window frame and glazing combination does make the energy modelling easier, but you pay a premium for imported windows and we hope to showcase Canadian suppliers where possible. We chose fiberglass for its strength, thermal performance and limited expansion/contraction through temperature extremes. It is also low maintenance and reasonably priced. Picking a frame and sash material is a good start. The South-Eastern Ontario climate necessitates a triple-pane glazing assembly. Beyond these basics, we chose casement and awning type windows for their air sealing properties. Sliding windows of any kind could never achieve the air-tightness requirements of a Passive House. A little investigation turned up four Canadian makers of windows that met our basic criteria. Of these four, only a couple offered a closed-back frame; an open-backed frame is slightly better in terms of an installation thermal-bridging coefficient, but the frames are weak and require much greater care during installation to avoid twisting or bowing the frame (which affects thermal performance and air-tightness). Both the frame and sash should be insulated in a fiberglass window; they do not typically have multiple isolating chambers like an extruded PVC window frame does. Insulating the frame and sash helps mitigate convection currents within the cavities. Finally, there should be a triple-seal between the sash and the frame; the three seals combine to create 2 distinct air spaces between you and the outdoors. More air spaces, more insulating value. The glazing assembly (also called a “Thermal Pane” or “Insulated Glazed Unit”) is where the magic happens. The frame and sash are functional, but contribute only to energy loss. This is not the case for the glazing assembly, which can contribute to heat gain, and as such needs to be very carefully planned. Not all windows can be heat generators; there is very little heat energy to be harnessed from indirect sun-light, so North-facing or heavily shaded windows should be fine-tuned for heat retention. Windows with Southern exposure are another matter; in this climate it makes perfect sense to adjust the low-emissivity coatings to strike a balance between gains and losses. There are two general types of coatings: hard and soft. The hard coatings (also referred to as pyrolytic) are built into the glass as part of the manufacturing process; they are a better choice for South-facing windows, but have a poor U-value. Soft Low-E coatings (also called Sputter coatings) do a better job of blocking infrared solar heat and as such, have a superior U-value but a poor SHGC (Solar Heat Gain Coefficient). There are of course many glass manufacturers and they each have a wide selection of Low-E coatings to choose from. Simply put, use a hard coating where you want to take advantage of solar gains, and use soft coatings everywhere else. It is also important to note that location matters too; applying a coating to glazing surfaces 2 and 4 will have a different affect on thermal performance (U-value) and the SHGC, than applying the same coating to surfaces 3 and 5 will (each surface of each pane of glass in the assembly is assigned a number). We also need to look closely at the spaces in between the glass panes; they can be of varying widths and will normally contain an air, argon or krypton fill – listed here in order of increasing performance… and cost. As if all these choices and specifications aren’t enough, there is one more component which ties it all together: the spacer. The type of material used for spacers is extremely important; they have to keep the glass panes together, sequester the gas filling and do their best not to act as a thermal bridge in the assembly. Aluminum spacers (with sealants) are the poorest performers. Stainless steel (also called a warm-edge spacer) is a better choice because it is much thinner. The top performer is called a Super-Spacer; it contains no metal, minimizing the thermal bridging effects. From here, it’s all a numbers game; every dimension, configuration and performance rating is entered into the PHPP to ensure you have chosen the right products/specs for the right locations. In the interest of limiting this rather lengthy post (sorry), I’ll dive into that next time!